A door that shows glaze well & that’s beautiful in any setting, the Hancock is the same door as the Conestoga (CWS) CRP-10161 door; however, the Hancock’s framing is 2-3/4″ wide. To perfect this door specifically for painted finishes, CWS created the Hancock (MDF). 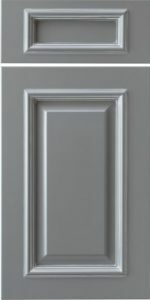 The MDF version of this door features five-piece, full MDF construction, which is very resistant to expansion & contraction, two issues that plague painted finishes on wooden doors.